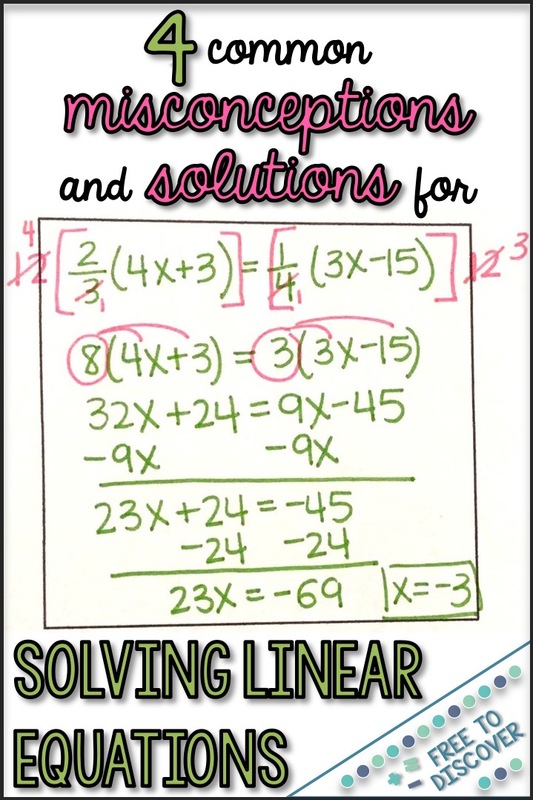 Solving linear equations is one of my favorite topics to teach. So fun! However, there’s always challenge when addressing misconceptions. Read on to learn about some of the errors you can expect and how to address them. 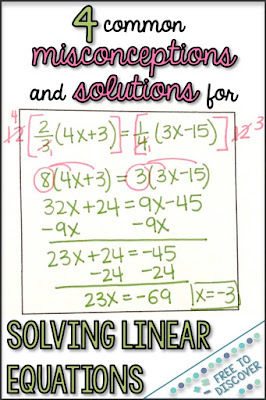 So it’s time to teach your students how to solve equations that involve combining like terms! Be prepared that some students will struggle with knowing when to simply add and subtract numbers and when they need to balance the equation and undo the operation they see. I tell my students that if the terms are on the SAME side, they SLIDE them together. If the terms are on OPPOSITE sides, they use the OPPOSITE operation. Helpful hint when teaching students how to combine like terms: Use shapes to identify like terms. Circle the x-terms and put boxes around the constants… and be sure to keep the sign in front of the term with it. This visual approach really helps my students see which sign belongs where. Lots of practice helps solidify this concept for students. Practice makes permanent! Special solutions bring their own set of misconceptions. The biggest issue I have seen is mixing up no solution and a solution of zero. This mistake commonly occurs when students try balancing the equation using the constants first. Then they end up with something like 3x=x and think this is no solution because they are not sure where to go from there. In an effort to avoid this mistake I encourage my students to balance the equation using the terms involving the variable first. This discovery worksheet has really helped my students understand this case. Inevitably every year at least one student consistently makes the mistake shown below. One way that I explain this is using order of operations. To assemble the expression, x was multiplied by 3 then decreased by 2 and finally divided by 4. Therefore when solving we must undo the division by 4 first because we use reverse order of operations. In a less “mathy” way I tell students that the numerator is trapped until they unlock it by multiplying by 4. If your students are struggling, it may help to show a comparison. Show the case where you would add 2 first and compare and contrast the two equations. By the time we get to equations with the variable on each side involving rational coefficients some students give me the “really? ?” look. I focus a lot on clearing the fractions in the first step so that students who struggle with operations with fractions don’t need to deal with them in every single step. When I teach students to solve equations involving distributing a fraction, I start with friendly numbers but then move to cases where distributing does not eliminate the fraction. We know it’s actually super easy to eliminate the fraction before distributing, but conceptually this can be a challenge for students. Students need to clearly understand that they only need to clear the fractions outside the parenthesis because they will be distributing to the other terms and, therefore, those will be affected by the change too. When students continue to question why I didn’t multiply everything by 12, I explain that each side of the equation has three factors. It’s the same as multiplying 2x3x4. Once I’ve multiplied 2 and 3, there is no need to also multiply the 4 by 2. This discovery worksheet facilitates a great discussion about this case. Join in the conversation! What other misconceptions do you see your students demonstrating? Subscribe today to receive a free middle school math resource!